Do you know your numbers? If getting more high-quality leads from your marketing events spend is a top priority, then it pays to know the return on investment of your marketing events tactics. 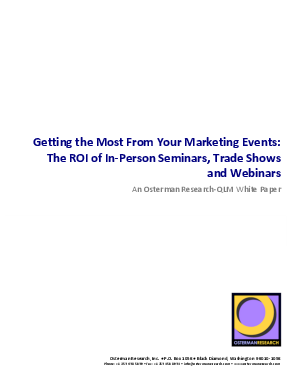 This new white paper explores which marketing events offer the greatest return on investment for your budget and staff. Read survey results of marketers using different types of events, and then calculate your own event costs with the marketing events ROI calculator.